On July 7th, 2016, the Conway Area Humane Society (CAHS) in New Hampshire received a call that a disoriented and seemingly injured dog had been spotted at a logging site that can only be reached by traveling deep into the forest on a logging road and is only accessible on ATV. How he got there they did not yet know, but the video they posted to their Facebook page made a family whole again. When the rescuers from CAHS reached the pooch’s last known location, they quickly spotted him trudging through the woods and were able to catch up to him and secure him with a leash. They described him as a gentle dog and anyone could see that he was exhausted and confused. He could barely walk and instead opted to lay down. 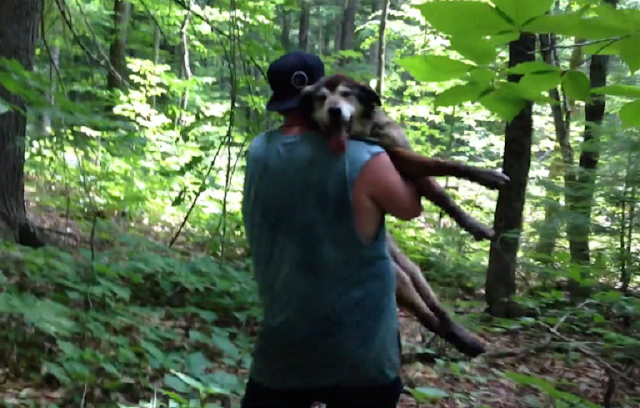 That’s when the CAHS volunteer, identified as Jake, slung the pup over his shoulder to carry him to safety and oh boy was that dog pleased to get the heck out of that forest! Tongue wag engaged. The video ends on an uncertain note but, as fate would have it, the next day all would be revealed. A friend of this snooter’s owner recognized him and he was brought home to his very worried dad. His name is Rocky and he is a whopping 17 years of age! His owner had been looking for him since the Fourth of July when he took off after being spooked by fireworks. At nearly two decades old, it would be hard on any dog who wandered that deep into the forest, but poor Rocky is also battling cancer. At the end of the day, this dog was well-missed, well-loved and has had one grand adventure! Fortunately, this tale ended in reunion and happily ever after, but always make sure to take special precautions when fireworks will be ignited near your dog to avoid similar situations before your pupper ends up in Narnia. Now have a good nap, Rocky, you’ve earned it!